The Dallas Jewish community gathered Sunday evening, Jan. 28, at SMU’s McFarlin Auditorium for the Jewish Federation’s ONE Night fundraiser and celebration of unity. 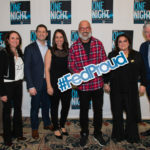 Sandwiched between an upbeat, warm performance by the Maccabeats and an edgy, hilarious comedy set by Howie Mandel, were remarks reflecting the essence of what Federation is all about. Board Chair Mark Kreditor reiterated the Federation’s mission to support the local Jewish community, Jews in need abroad and Israel. “It is our hope now that charitable giving to your Federation is no longer done because of guilt, but because of pride,” he said. Kreditor emphasized that, as the campaign grows, the good work of the Federation grows with it. Additionally, charitable giving is good for the human spirit and soul. Sandi Bodzin, Rob Solls and Dora Klaff, three direct recipients of Federation resources, shared how the organization had influenced their lives. Bodzin, who lost her husband Mark in October to a rare and aggressive form of frontal lobe dementia, explained that the Federation cared for her family and connected them with JFS and The Legacy at Home. She went on to say that the warmth of the Jewish community and Federation made her and her family’s life measurably better. “Tonight you will have the opportunity to help so many people whose lives are made better through your gifts,” Bodzin concluded. Solls spoke about how the Federation impacted many phases of his life: preschool at Solomon Schechter (now Ann and Nate Levine Academy) and summers at JCC camps as a child; BBYO in high school; UT Hillel in college; a sibling Birthright trip; and now coming full-circle as a parent of a toddler engaged with PJ Library, the JCC and Levine Academy. “It is now my generation’s responsibility to step up and support this wonderful organization… It is our time to take the reins and create safe and lasting memories for our families,” he said. Dora Klaff, Houston Federation staff member and Hurricane Harvey survivor, explained how more than 70 percent of Houston’s Jewish community was impacted by the flooding. Today, more than four months later, Houston is still a community still in crisis. Klaff evacuated her home as floodwaters rose; it is scheduled for demolition Feb. 5. She explained that, for the Jewish community of Houston, Federation has been their lifeline. “For some, the Federation provided volunteers to clean out their homes. For others, it was a resource for basic supplies or to have someone to listen. When they were at their lowest they knew their Federation family was there,” she said. Klaff thanked the Dallas Jewish community for its yeoman support of Houston Jews after the hurricane. Klaff continued, adding that with the support of the national Federation system, Houston has raised almost $20 million to provide emergency financial assistance to families in need and to support the rebuilding of our synagogues, JCC, day schools and senior community. “There is still work to be done. This is why we need the Federation. This is how we make a difference. This is what we do,” she said. Presenting sponsor of ONE Night was BB&T. Co-chairs were Angela Aaron Horowitz and Doug French, Jolie and Michael Newman and Natalie and Michael Waldman.